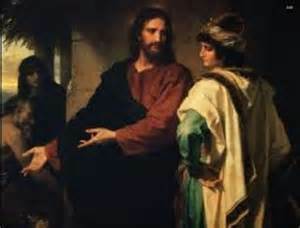 Jesus is about to leave when the young man comes running to Him. The question must have been burning on his heart and he knew he had to get to Jesus and ask Him before He left. In every human soul, the question of eternal life singes until satisfied. In his work, Pensees, the philosopher Pascal observed that we fill our lives with distractions just to avoid this very question. When we are quiet or alone, it surges up and must be dealt with. We realize the feebleness of our nature and our true vulnerability. We are then faced with the clear decision that either there is no God in which case I can live as I want but my life is meaningless, or there is a God and I can live forever but I must acknowledge His authority and live by His precepts. Many of us make something of an effort. Like the rich young man, many of us modern religious persons live comfortable and fairly moral lives. We follow God’s rules while we pursue the average American dream. Yet, our hearts still burn for more. Thankfully, the man in the passage pushes Jesus on the issue. Jesus affirms that the man has done the minimum requirement for eternal life. So why isn’t he satisfied? This is why “Jesus, looking at him, loved him.” The man had opened his heart with a listening ear, courageous enough to seek out the answer rather than bury the discomfort. He asked Jesus that challenging question I have suggested in past posts – “Lord show me my blind spot.” And Jesus does, out of love. Christ calls us beyond the minimum. The philosophical and theological definition of “perfect” is “full or complete.” This is why He tells the man he is “lacking” one thing only. Christ, God incarnate, is about to set out for a journey. He offers the man the opportunity to come follow Him. What a privilege! Yet to do this, he would have to leave everything behind – another fork in the road. How many times do we turn down incredible opportunities to stay in our comfort zone? We get sentimental or attached to any number of our possessions and it undermines our freedom to say yes to the gifts of Christ that come in the form of service opportunities, vocation, relationships, even careers we may end up finding more fulfilling but less lucrative. When we let fear, comfort, or greed hold even a small part of us back from God, we experience a nagging feeling of hunger because we are not quite full. It’s normal to feel this divided heart – a simultaneous desire for complete abandonment to God and the fullness of joy and peace that accompany it, and the safe visible comforts of a worldly success which give us a kind of safety net but leave us feeling a bit cowardly. I appreciate that Jesus says it’s impossible for us to make this leap by human effort alone because it speaks to my own experience. Rather than being discouraged by my own failure, I find hope in Jesus’ words that “all is possible for God.” The difference between the Old and New Covenant, is that in the first God gave His saving truth but in the second He gave us the grace to live by that truth. The young man in this passage encountered Christ and saw His gaze of love. May we too be blessed to see this gaze of love for us and say yes to perfect fullness. It’s okay if we leave feeling sad. It’s difficult to give up attachments. We don’t actually know if the man in this passage is sad because he won’t give up his possessions or because he will. The important thing is that we respond to grace, confident in Christ’s promise that our “sadness will be turned to joy” (John 16:20). Do you avoid solitude or quiet? Do you have a nagging feeling inside? Do you know why? With the help of Christ, consider honestly what fears, comforts, or ambitions hold you back from following Him with complete freedom and abandonment. When did you make a sacrifice for Christ that turned out to be a terrific blessing? What held you back at first? How did you overcome those inhibitions? How did Christ exceed your expectations? Christ challenges that possessions hold us back. Give away a possession this week. Choose one fear, comfort, or ambition that is holding you back from following Christ’s lead completely. Practice the opposite virtue and do concrete actions to detach yourself. Be sure to pray and ask for grace. You will need Christ to help. Talk with a Christian who knows and cares about you so they can offer ideas and perspective. Thank God for His grace in your life. Make a list of His gifts and of all the fears He has already freed you from up to now. If God’s providence creates the opportunity, have the courage and humility to encourage someone else with your witness about how God freed and fulfilled you. To receive these weekly posts automatically in your email just click the “follow” tab in the bottom right hand corner and enter your email address. God, who is One, referred to Himself as “us” and created two persons, distinct yet one to be His image. The unity of man and woman as the image of God is again affirmed in Genesis 2:18-24 when man is not complete without the creation of woman. Although we may joke that a dog is man’s best friend, (and at times both men and women feel that way! ), the truth is that we were made to be a communion of persons in life-giving love. Woman is created from man’s side, showing that though she is different than man, she is also of the same nature and of equal dignity. Because the family is the icon of the Trinity and therefore of God Himself, it makes sense that it has suffered the most from Satan’s attacks and from the effects of original sin. The unity between man and woman has been harmed and the joy of openness to life undermined. Sometimes we can feel so far of a distance from our nature at creation that it seems like God’s revelation about ourselves in Genesis is just a dream. Rather than unity, we more often see power struggles, selfishness, adultery, use and abuse, and so on. In addition, the gift of fruitfulness has now been categorized as a health problem, worthy of universal “preventative care” as part of women’s health. After the Fall of Adam and Eve however, God promised a Redeemer. In Genesis 3:15, called the protoevangelium, or “First Good News”, God says to the snake, “I will put enmity between you and the woman, and between your offspring and hers; They will strike at your head, while you strike at their heel.” At the incarnation, “the Word became flesh and dwelt among us”(John 1:14). He brought us truth, healing, love, and redemption. Through Christ we now know the fullness of God’s revelation and we have access to the graces needed to become re-made in His likeness. In today’s Gospel, Jesus juxtaposes the two possible views toward marriage: a skepticism based on the reality of sin, or a hopefulness based on the reality of redemption. Jesus has not given up on marriage and the family, He has come to redeem it. It is the very image of our Trinitarian God. One of my favorite images right now is “Mary Undoer of Knots.” St. Paul calls Jesus the “New Adam” because by Christ’s obedience He untied the knot of Adam’s disobedience. Likewise, Mary is the New Eve, whose fiat, or Yes to God untied the knot of Eve’s “No”. Sometimes I feel like life is a knotted up ball of a mess and I feel overwhelmed and powerless. 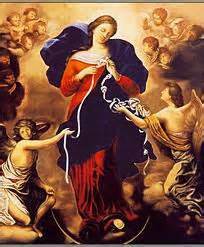 It’s then that I look at the image of Mary undoer of knots and I surrender my life back over to our Blessed Mother and Christ, confident that if I am patient, they will undo the knots, one at a time. Consider your own feelings regarding marriage and family. What makes you feel discouraged? Surrender it to Christ and pray for Him to redeem it. What makes you feel hopeful? Think of a couple you know who seem to be truly united in love, who will each other’s good and have Christ at the center of their relationship. Reflect on how authentic love is life-giving and creative. Sometimes this produces human life but even when that isn’t a possibility it still expresses itself in ways that are creative and constructive. Consider the phrase “a labor of love.” When we love something we can’t help but express and share it. Pray for marriages and families this week. Attend a daily Mass and/or the sacrament of Confession. Pray for an increase in grace in your family. Reflect on the humility and love of the Holy Family. Jesus only spent 3 years in His public ministry. He spent 30 simply being Mary’s son. * You can receive weekly emails of these posts by following our website. Just click on the small blue tab in the bottom right hand corner that says “follow” and enter your email address. * These Sunday meditations are intended to engage the heart and imagination in prayer and include a practical application (resolutions) to your daily life. In our presentation on prayer I offer a more detailed discussion of ways to pray with Scripture that can take 5 minutes, 15 minutes, or half an hour and vary in depth depending on your time-frame and prayer goals.